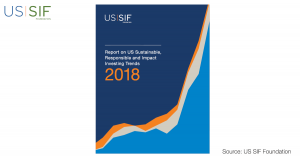 Call it “sustainable and responsible investing” or “SRI” or “ESG investing” or “impact investing” – whatever your preferred nomenclature, “sustainable investing” in the U.S.A. is making great strides as demonstrated in a new report from US SIF. 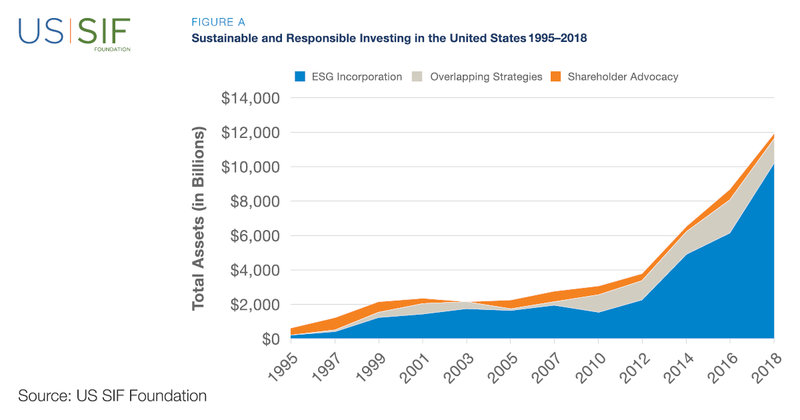 At the beginning of 2018, the institutional owners and asset management firms surveyed reported total sustainable investment at US$12 trillion AUM – that is 26% of the total assets under professional management in the U.S.A. — $1-in-$4 of all investable assets! That’s an increase of 38% since the last US SIF report at the start of 2016. The AUM of sustainable investments then was $8.72 trillion. That was $1-in-$5. And that was an increase of 33% since the survey of owners and managers at the start of 2014. Sustainable investing jumped following the 2008 financial crisis, with growth of 240% from 2012 to 2014. 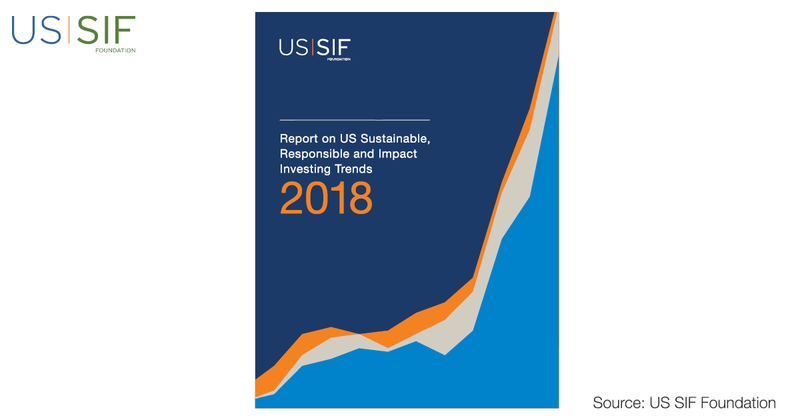 The US SIF bi-annual survey of investors began in 1995, when the total of sustainable investments professionally managed was pegged at $639 billion. There has been an 18-fold increase in sustainable investing assets since then – at a compound rate of 13.6% over the years since that pioneering research was done. 496 institutional owners (fiduciaries such as public employee pension funds and labor funds – these represented the component of the survey results at $5.6 trillion in ESG assets**). 1,145 community investing institutions (such as CDFIs). a range of diversity and equal employment opportunity issues. The shareowners and asset managers surveyed regularly engage with corporate executives to express their concerns and advocate for change in corporate strategies, practices and behaviors through presentation of resolutions for the entire shareholder base to vote on in the annual corporate elections. Proxy access for shareowners (business associations have been lobbying to restrict such access by qualified shareowners). Corporate Political Activity (political contributions, lobbying direct expenses and expenses for indirect lobbying by business groups with allocated corporate contributions). A range of environmental and climate change issues. Labor issues / equal employment opportunity. Call for independent board chair. Call for sustainability reporting by the company. Public employee pension systems/funds led the campaigns with 71% of the resolutions filed in 2016, 2017 and 2018. Labor funds accounted for 13% of filings. Asset/money management firms accounted for 11.5%. 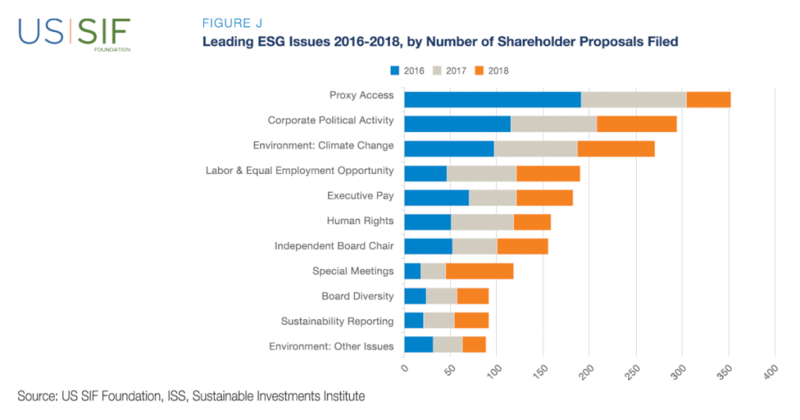 A total of 165 institutional owners and 54 asset managers filed or co-filed resolutions on ESG issues at the beginning of the 2018 proxy voting season. The report was funded by the US SIF Foundation to advance the mission of US SIF. The mission: rapidly shift investment practices towards sustainability, focusing on long-term investment and the generation of positive social and environmental impacts. Both the foundation and US SIF seek to ensure that E, S and G impacts are meaningfully assessed in all investment decisions to result in a more sustainable and equitable society. The bold name asset owners and asset managers and related firms that are members of US SIF include Bank of America, AFL-CIO Office of Investment, MSCI, Morgan Stanley, TIAA-CREF, BlackRock, UBS Global Asset Management, Rockefeller & Co, Bloomberg, ISS, and Morningstar. Prominent ESG / sustainable investment players include Walden Asset Management, Boston Common Asset Management, Clearbridge, Cornerstone Capital, Neuberger Berman, As You Sow, Trillium Asset Management, Calvert Investments (a unit of Eaton Vance), Domini Impact Investments, Just Money Advisors, and many others. ** Institutional owners include public employee retirement funds, labor funds, insurance companies, educational institutions, foundations, healthcare organizations, faith-based institutions, not-for-profits, and family offices. This entry was posted in Business & Society, Climate Change, Community Investing, Corporate Citizenship, Corporate Sustainability, ESG Issues, Global Warming, Human Rights, Impact Investing, Investment Case, Investor Engagement, Shareowner Activism, SRI, Sustainability Professionals, Sustainable & Responsible Investing, Sustainable Investing and tagged AFL-CIO Office of Investment, As You Sow, Bank of America, BlackRock, Bloomberg, Boston Common Asset Management, Calvert Investments, Clearbridge, climate change, Community Investment, Cornerstone Capital, Corporate Philanthropy, Corporate Political Spending, Corruption Risk, Croatan Institute, Curtis Ravenel, Diversity & Inclusion, Domini Impact Investments, Eaton Vance, Forum for Sustainable and Responsible Investing, human rights, Institutional Shareholder Services, ISS, Joshua Humpreys, Just Money Advisors, Labor Pension Funds, Lisa Woll, Meg Voorhees, Morgan Stanley, Morningstar, MSCI, Neuberger Berman, Nuveen, Product Safety, Proxy Access, Proxy Resolutions, Public Employee Pension Funds, Responsible and Impact Investing Trends 2018”, Rockefeller & Co, Shareholder Proxy Resolutions, TIAA-CREF, Trillium Asset Management, UBS Global Asset Management, US SIF, Walden Asset Management, “The Report on US Sustainable by Hank Boerner. Bookmark the permalink.